Seventy miles northeast of Lake Tahoe, the similarly sized but much less visited Pyramid Lake presents a very different appearance - 2,500 feet lower in elevation in the barren basin and range country on the dry east side of the California mountains, the lake is enclosed by treeless hills and sandy, sagebrush desert, and although Nevada's second city Reno lies just 30 miles south, there is very little settlement nearby. 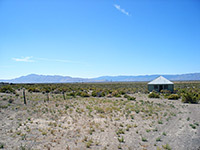 This area is part of the Pyramid Lake Indian Reservation, a Paiute preserve of about 1,800 people, which also includes a five mile wide strip of land around the edge of the lake and a narrow corridor to the south along the Truckee River, the main inlet stream. Like most lakes in Nevada there is no outlet; water is lost only by seepage or evaporation, hence the lake is quite salty. The reservation has three small towns: Sutcliffe on the west shore, Nixon (the tribal headquarters) at the southeast corner of the lake, and the slightly larger community of Wadsworth, 14 miles further south near I-80. 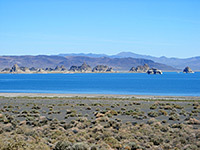 A limited amount of recreation takes place on Pyramid Lake, mainly fishing, boating and waterskiing, concentrated along the southwest edge since this is the only section accessed by a paved road. Other parts may be reached by unpaved roads of varying quality, inviting backcountry exploration, and the whole place is starkly beautiful, in a large scale, almost abstract kind of way. The closest towns with hotels are Fernley (18 miles), Reno (47 miles) and Sparks (44 miles) - distances from Nixon. 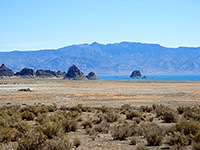 The usual approach to Pyramid Lake is from Reno/Sparks along NV 445, a road that becomes steadily less traveled northwards, and the last few miles cross completely undeveloped land beside the Virginia Mountains, over a ridge (Mullen Pass) and down to the lakeshore. The ridge has a grand view of the deep blue lake, extending some distance east and west, and backed by the arid reddish slopes of the Lake Range. Most of the lakeside is equally free of any development; the road along the west edge reaches the village of Sutcliffe, whose facilities include a marina, visitor center, store, lodge and fish hatchery, then becomes unpaved and dusty, while the south shore road crosses more deserted land for 13 miles to Nixon. This small town of a few hundred people has one gas station and general store, where tribal permits may be purchased - these are needed for any parking, camping or water-based activities on the reservation, in particular to use any of the 20 or so access points along the southwest shore, where short tracks lead to named beaches or promontories. All the beaches seem clean and free of litter, though the land hereabouts is formed of earthen slopes dipping gently down to the water, without any rocks or cliffs, so the scenery is not particularly interesting. Also, all of this section of the shoreline is in full view of traffic on the nearby road. Nixon may also be approached from the south via NV 447 from I-80 and Fernley, a road that continues northwards past Winnemucca Lake towards Gerlach and the Black Rock Desert. 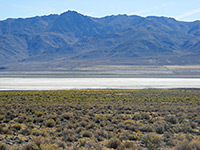 The more geologically interesting parts of the region are either off limits to the public or reachable only by rough tracks, including, on the east side, The Pyramid, after which the lake was named (by explorer John C Fremont who visited this region in the winter of 1843-4); this is a conspicuous, pointed tufa mound right at the edge of the lake, forming a tiny island at times of high water. Just south of the Pyramid, Anaho Island is a rocky hill surrounded by the water and also formed of tufa, protected as the Anaho Island National Wildlife Refuge and home in spring and summer to a large population of American white pelican. Another unusual formation is the Needle Rocks on the north shore, an isolated group of jagged tufa peaks enclosing a geothermal area with hot pools and a geyser. A side track leads to the rocks but all this area is closed to prevent damage to the delicate structures, and visible only from 3 miles away along the west shore road (NV 445), a little way beyond the end of the pavement. Past here, the road moves away from the lake, crossing empty desert for 30 miles until the surroundings gradually become a little greener around Honey Lake and the dispersed town of Wendel, over the border in California.